Staying calm, being a successful career woman/business owner/whatever, all on top of being a mum takes a certain combination of qualities. Over time, I have watched lots of mums go up and down with their levels of calmness and control. No one really warns mums about how to juggle working life with being a mum, partner, sister, daughter and friend. There tends to be a huge focus on how to ‘learn’ to be a mum in the first 12 months, but after that you’re on your own. Yikes!. It’s a lot on the plate of any mum. While the list below is not exhaustive, here are some of the regular things that successful working mums do! Sometimes ‘near enough is good enough’ and it just has to be. Striving for perfection is a useless pursuit because, truly, it doesn’t exist. And these women realise it. We’re human. So, while perfection may be the goal, these women know they will be always putting 100% effort in the situation that’s in front of them. They realise there is nothing more than can be humanly done without tipping themselves over the edge. They are satisfied with what they’re able to achieve in a day. Successful women fill their days with things that are meaningful to them, so there’s no time for gossip and negativity. They quickly learn who the positive and happy people are in their lives and they make room for these people. All the gossipers aren’t prioritised in their weekly planning. Who has time for gossip when there is quality time to be spent with family, friends and building a working life you’re passionate about? Complainers are bad news and don’t focus on solutions. Successful working mums focus on solutions. The saying, ‘It takes a village to raise a child’ is never more true in the lives of successful working mums. While we’re not advocating that mums spend no time with their kids, successful working mums realise that there needs to be a reliable, nurturing collection of people in their ‘village’ to raise their child. This may be picking the right school with great after-school care, seeking the help of other mums to share car loads to and from sport, or seeking the help of a tutor when homework is creating family angst at home. Whatever the situation, successful working mums know how to build (and keep) a great network of people around their family. While so many mums are notorious for saying ‘yes’ to everything – ‘yes’ to the school bake sale and ‘yes’ to every social event – over time, successful working mums learn how to say ‘no’. They know their tipping point and try to stay away from it. They know that if they say ‘yes’ too many times they are more likely to experience stress and burnout and nothing will be fun! 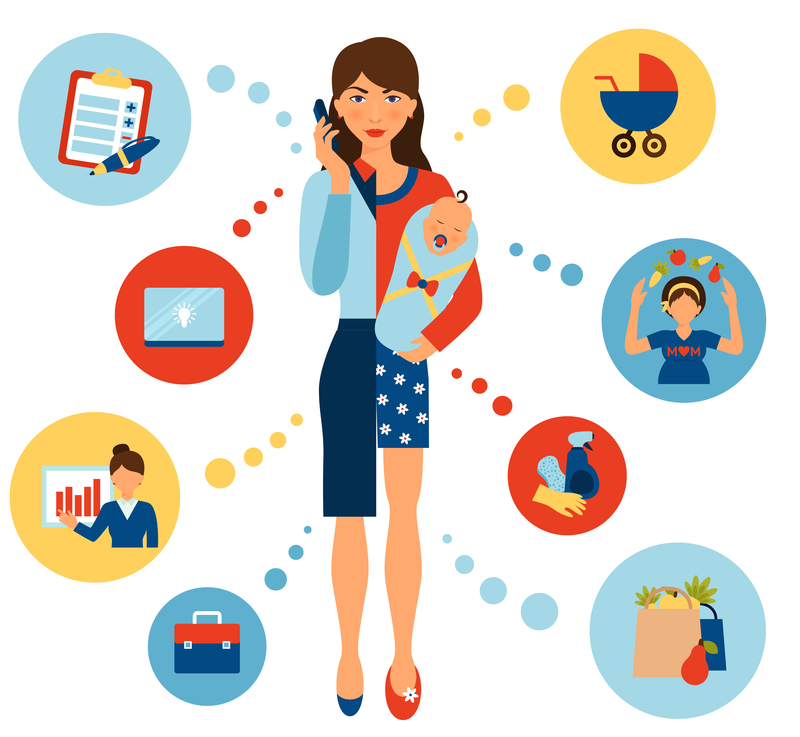 Busy working mums don’t strive for balance. Their lives are made up of a blend of lots of parts that make them who they are as a whole. So, they acknowledge that there are days when work has to take a bit more of a front seat, and days when the children or a partner receives their full attention. It might not even be the same blend from week to week, but they will maintain a good mix of family, healthy eating, fitness and work. While it’s not uncommon to hear that ‘mums can do more than one thing at once’, the successful working mum knows how to focus. Watch a part-time mum at work and you will see what I mean. More often than not she is more productive than the full-timers around her because she has a 3 pm school pick up to get to and there’s no time to waste at work. There’s no time for gossip around the coffee machine. When she’s home, she avoids work and stays focused on the children whenever possible. Of course, there are times where the rules are broken (you wouldn’t NOT pick up your child from school if the school rang to say they’re sick – get my drift? ), but in general focused mums give complete attention to the detail required at the time. Yep, they make time for exercise and healthy eating because they know they have to last the distance. That means they need the energy to last through the day and not be tired and irritable with their children or place themselves last in life. Busy mums know there’s no point building a successful working career or business if they die of a heart attack from poor health in their 50’s. Successful working mums know that their children are watching and that the example they set for their kids is a really important part of the life they lead. BUST THAT SUGAR HABIT – 5 DAYS TO A NEW YOU! November 24, 2015 Editor@thefitbusymum Comments Off on BUST THAT SUGAR HABIT – 5 DAYS TO A NEW YOU! February 17, 2016 Editor@thefitbusymum Comments Off on Ready…set…budget!